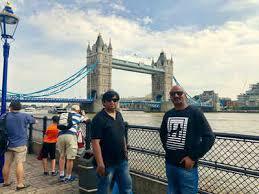 2 Bengaluru businessmen ride 23,500km to London Two Bangalore based businessman travelled to 21 countries to reach London. They started their journey on 16th April. It5 took them 75 days to complete this journey Manjunath Chikkaiah, a businessman, and King Richard, a factory owner, both aged 42, rode their Triumph Tiger 800 bikes for 23,500km across 21 countries to reach London on Saturday. They are flying back to Bengaluru on Wednesday. They both rode triumph tiger bikes to travel 23500 km they completed there dream to reach London. During their two-and-a-half month journey, the adventure seekers passed countries like Bhutan, Myanmar, Thailand, Laos, China, Kyrgyzstan, Uzbekistan, Kazakhstan, Russia, Estonia, Latvia, Lithuania, Poland, Czech Republic, Austria, Italy, Switzerland, France, Belgium, and the Netherlands to reach London. “We covered 450-500km every day. We experienced all four seasons of the weather. The mercury had touched 42°C in China, while heavy rain greeted us in Thailand, following us up to China. It was spring in Estonia and we were stuck for five hours because of heavy snow in Kyrgyzstan,” the duo said. They both are part of white dragon adventures which is a long distance travelling group Asked whether they ever wanted to come back midway, Manjunath said, “This is the first leg of our world trip. It was a challenge for us. We never thought of returning. In fact, every time we crossed a country, we only became more motivated to reach our destination.” The preparations for the ride began two-and-a-half years ago, as part of which, they went to Kanyakumari and Leh. They even drove a car to Singapore.